I’ve been home from the Phillies v. Cubs game for over an hour, but I can’t sleep. My house is a disaster. Bags of food, clothes, housewares and junk are piled sky high in the living room. I spent my afternoon assimilating my compost into the back alley dirt instead of trying to clean my walls. I haven’t finished moving stuff up from the basement, or taking my pots and pans out of the kitchen, or pulling posters from my wall. I’ve given no thought to disassembling the dining room table or cramming this disaster into my car. Though maybe not right away, I’m going to miss South Philly. Its sketchy corner stores and wary neighbors have been a part of my life since my sophomore year of college, when Nate was living down here and we were causing all sorts of ruckus. Ricky, our most friendly neighbor and scrapper extrardoinaire, is openly sad to see us go. In the past 48 hours I’ve had my last Tony Luke’s sandwich, Benna’s Open Fire, Noche pizza, La Colombe coffee, Wired Beans baked good, Conshohocken Café wrap and Citizens Bank Park hotdog. Needless to say, I’m feeling more than a little queasy. This morning I dumped a mess of un-moveables out on the curb that vanished within an hour. I’m meeting up with a friend I haven’t seen in eight years to pass on some furniture in the morning, when Glenn Wagner makes his guest appearance in town for all of two hours. I had my last Back on My Feet Run (and I didn’t cry – though barely), and I stopped by La Salle to catch up with a couple of friends and former bosses. And if I can get this mess from my house into my car and my parents’ truck tomorrow morning, I’ll be ready to roll. Don’t get me wrong – I’m excited. It’s just that right now I’m feeling a little more melancholy than farm ready. Everyone in my world has been incredibly supportive, and the past two weeks have done nothing but prove that over and over again. At an Adams clan wedding last weekend, about a hundred aunts and cousins shared their excitement and wished me luck on my new adventure. Nate threw me a really sweet going away party with some city friends with similar sentiments. Last week, I came home from a Sixers game to find this perched on my desk. My darling roommate Olivia, who has been nothing but wonderful despite my leaving, strikes again. My dear friends and coworkers at Child Advocates had a lovely sendoff for me and our interns on Wednesday. Potluck, ahoy! 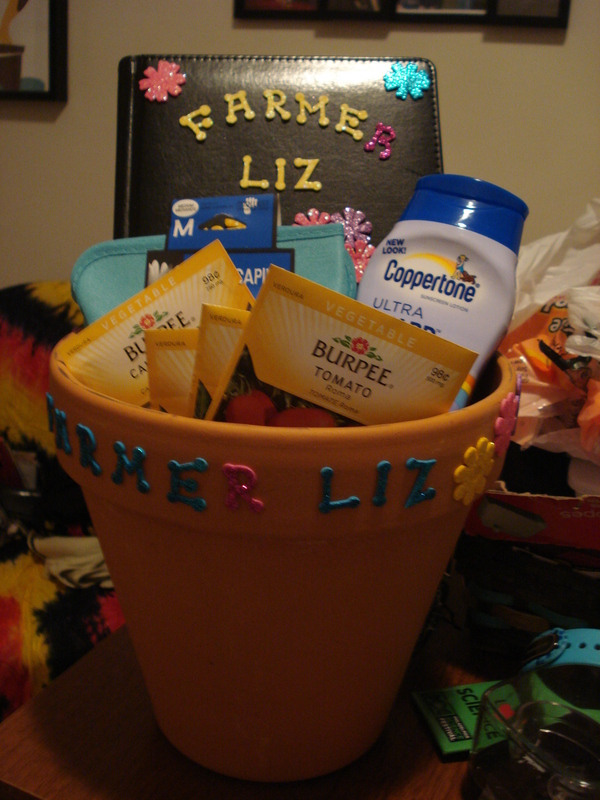 As I melted into a delicious, starch-induced coma, my boss Frank handed me a bag of farm gifts – gardening tools and gloves, a really phenomenal utility knife and the sweetest words from my coworkers. 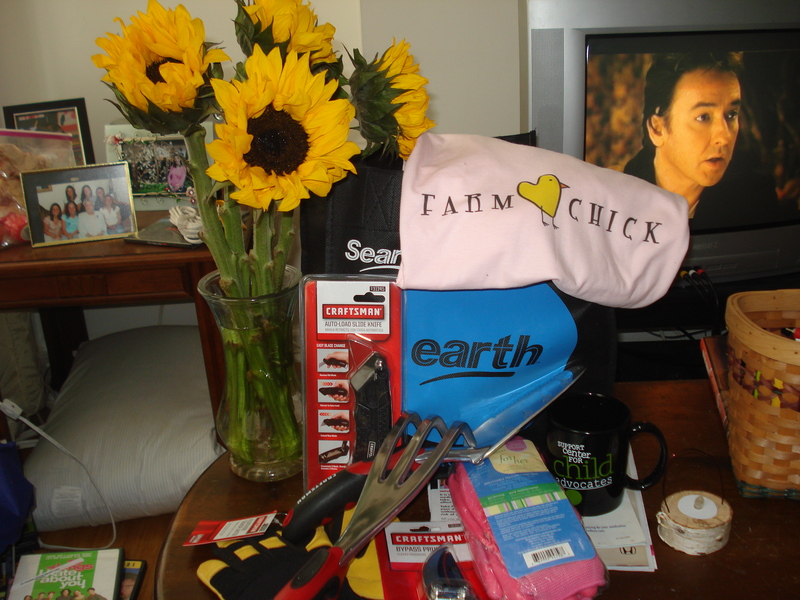 Sonja sent me off with a bouquet of sunflowers (my unspoken favorites), Chris made me a beautiful necklace, and Sandra presented me with a totally adorable “Farm Chick” shirt that was enjoyed by all. I was doubly pleased to catch my boy John Cusack as a Stephen King character in this photo - clearly also wishing me luck. Bob, my wonderful office mailman, also brought me a delightful sendoff gift. 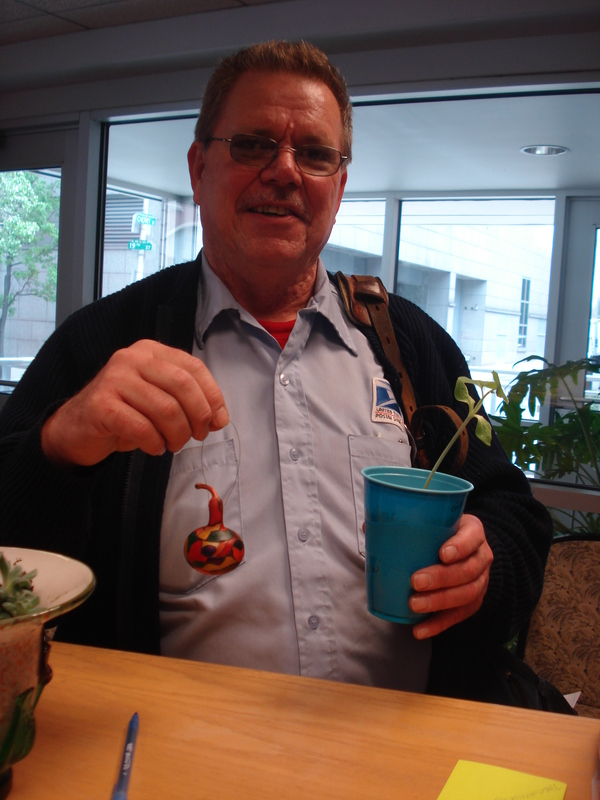 Bob is a member of the Pennsylvania Gourd Society – one of the only guys and one of the only Philadelphians. He’s been sharing all this interesting info about the nature of gourds – how the EPA uses them to absorb toxins from sites, and how he grows and crafts his work. So I was totally thrilled when he arrived Wednesday morning with a Mini Martin Gourd vine for me to take on my travels, and a small ornament he’d decorated. Stay tuned for more on this – I will certainly be keeping you updated on our little gourd’s progress. 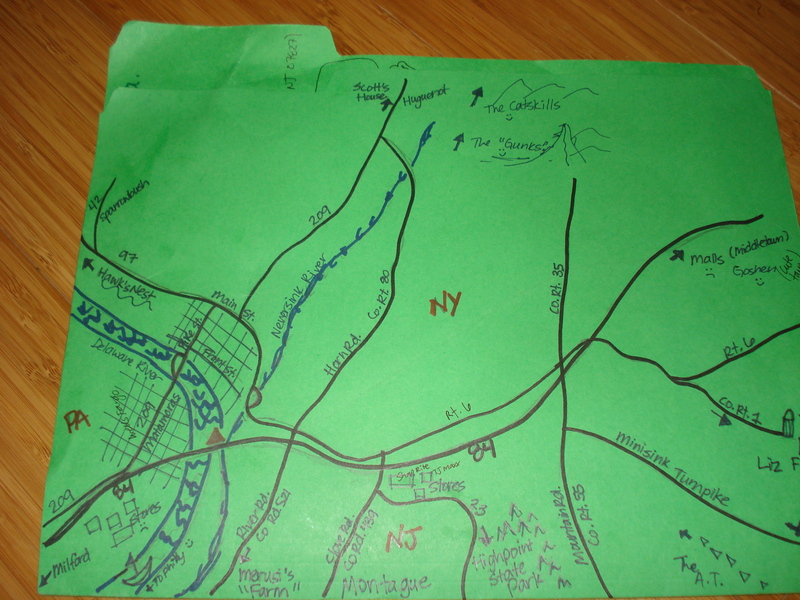 Thursday night I met up with some of my runner gals, work gals and other friends, and my BoMF friend Sarah gave me the most helpful gift of all – a native’s map and guide to Port Jervis! Inside the folder are lists of town highlights, surrounding area hot spots and pamphlets and trail maps for hiking. I am totally stoked to explore. It hurts to leave my amazing second families. I know I shouldn’t really feel that way – Philly is only going to be three hours away. But I didn’t study abroad while I was in school and I’ve never traveled very far from the people I love. I’ll be back a ton, for sure, but something about this move feels more final than the others – maybe that’s why I am sitting here, this close to midnight, unpacked. So long, South Philly. We had a good run. I’ll be back to visit you soon – with vegetables! This entry was posted in Uncategorized and tagged Child Advocates, Moving, Organic Farming, South Philly by wagnere1. Bookmark the permalink.